Former Times | W. Wayne B. Posted on January 17, 2013	by W. Wayne B. They described to me a former time. 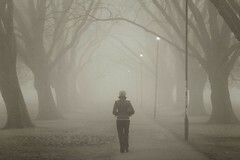 A woman appeared in a foggy night. A friend of mine saw her smile. Her long black cloak blew in the wind. The moon rose above her. Her eyes reflected the rising beacon. It was a tranquil night of peace. Her beauty transfixed my friend. This entry was posted in Poetry and tagged beacon, beauty, eyes, love, peace, poem, woman, z1498. Bookmark the permalink.